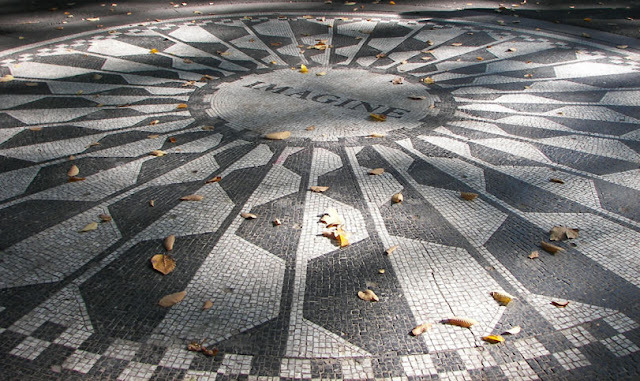 John Lennon always considered himself a poet before a musician. Before he was a Beatle he was an artist. Born in 1940, today John Lennon would be turning 71 but we know that he is not celebrating a birthday today and we all know why. What we are left with are his words, his images, his music and his energy. Would John have settled for dotage or would he be leading the marches on Wall Street today? He was fond of saying, "Gimme some truth. All I want is the truth...just give me some truth." John's truth touches us all. Seattle musician Martin John channels John Lennon's line art, music and energy while touching upon John's influence not just on him but on musicians and people everywhere. On a crisp October morning in New York City I can picture John in Central Park today. He is walking with his wife - his life partner - aware of his fame while searching for anonymity amongst the trees. John would stop and scribble down some notes or pull out a sketchbook and capture a moment. John was adept at capturing moments. He grabbed the 60s and shook it from its complacency. We are all richer for his holding our hand and nudging us toward another smile. A well deserving honor. Mr. Lennon continues to touch us and more than his ideas and words living on I think that he would get off on the fact that he inspires the creation of new art on a daily basis in global places.